Great success for the SURVANT workshop in Madrid! Last week, the SURVANT consortium organised its first project workshop focusing on visual surveillance, targeting many project end-users. 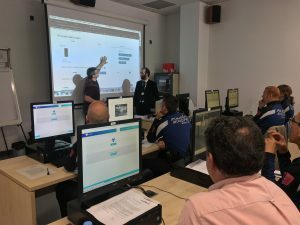 Hosted by the Police Academy of the Policìa Municipal de Madrid, the partners implemented a training session where police officers had the opportunity to test the advanced features for video surveillance analysis of the preliminary version of the SURVANT platform. The SURVANT team showed to participants the platform potential to enhance their competences and abilities in analysing video footage from surveillance video archives, by detecting specific behaviour suspicious patterns and enabling searches for specific events, people and objects. Over 35 police officers were involved in the training. They were glad to experience this tool and evaluated very positively the activity run in the framework of the SURVANT project.